The premiere industry & networking event. 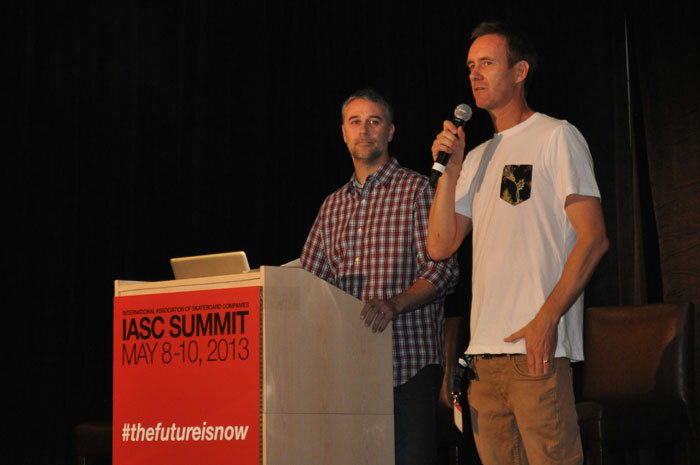 The 6th Annual IASC Skateboarding Summit was held on May 9-10, 2013 in Orange County, Calif. and hosted experts from the skateboarding industry who gathered to share their thoughts on the current state of skate. 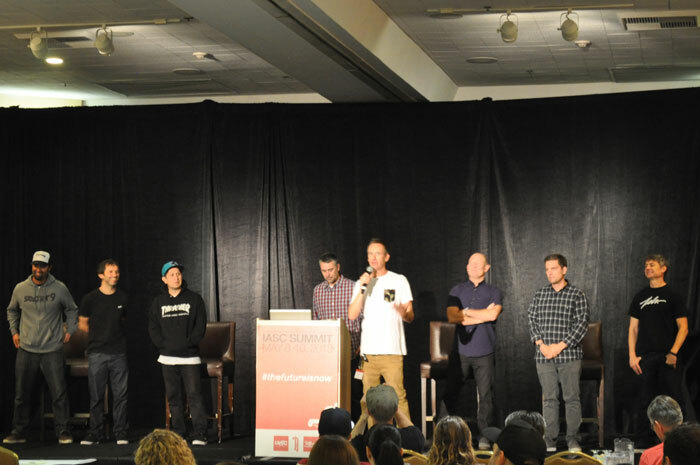 The lineup of speakers was incredible; highlighted by a presentation from Bobby Kim of the Hundreds urging the industry to stop talking and start taking. 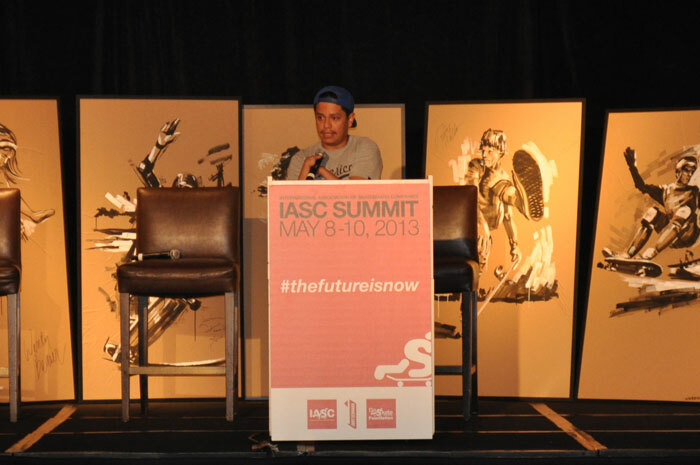 "Skateboarding had to be the root of everything we were doing," explained Bobby during his presentation on Day 1 of the IASC Skateboarding Summit. "But we were never a skateboard brand. We've never claimed to be a skate brand and we still don't claim that to this day. 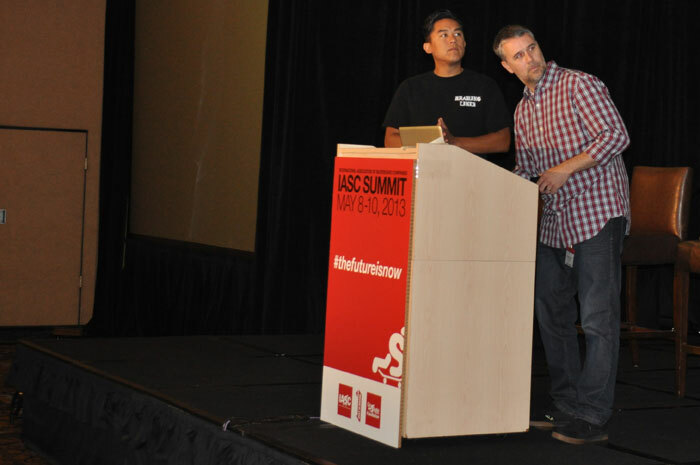 But, we recognized that everything starts with skateboarding and we were affected by skateboarding and wanted to contribute to skateboarding in any way that we could." 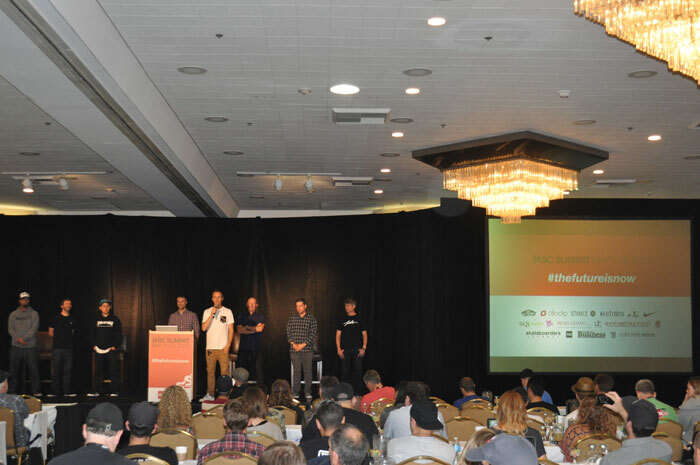 Other highlights from the 2013 IASC Skateboarding Summit included the Blind Damn.. 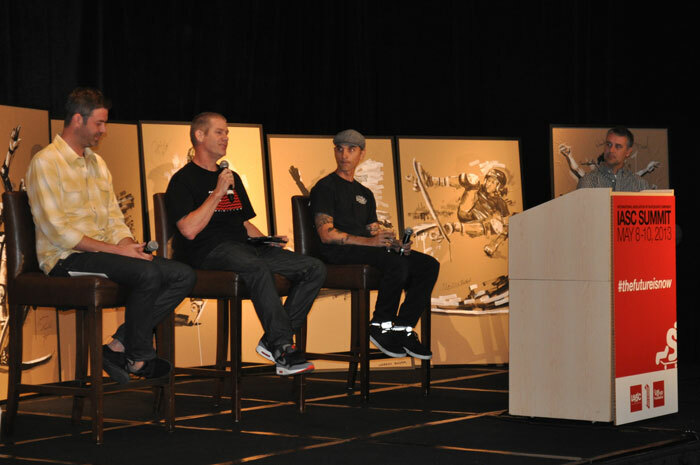 Premiere, the 4th Annual Skateboarding Hall of Fame Induction Ceremony, and the Vans Pool Party presented by Pro-Tec. 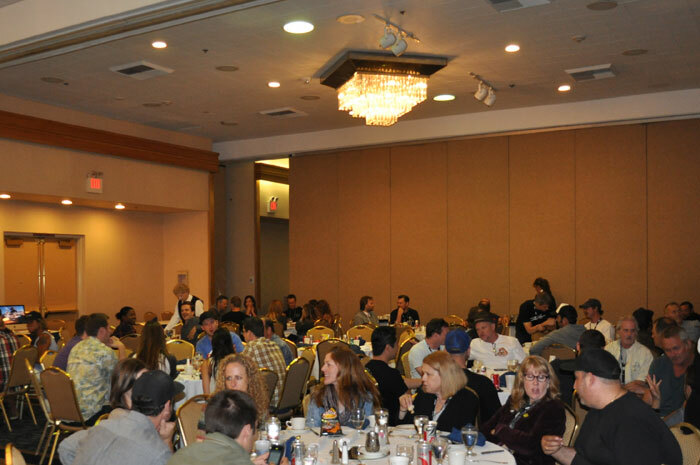 Enjoy these photos of the two-day event organized by IASC Executive Director Josh Friedberg and Jardine Hammond. 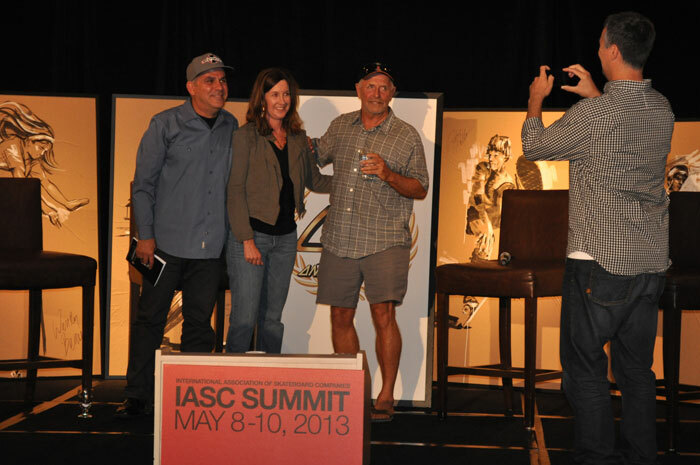 And be sure to mark your calendar for the 7th Annual IASC Skateboarding Summit in 2014, with dates soon to come! 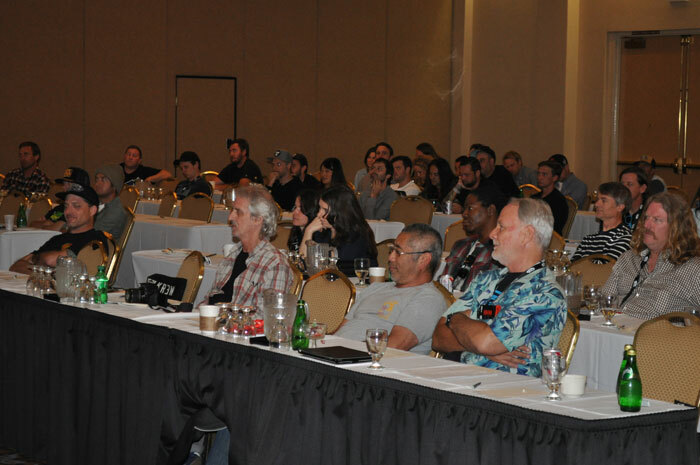 And remember, any company with products or goods and services within the skateboard marketplace are eligible to join the IASC, the skateboard industry’s non-profit trade association. 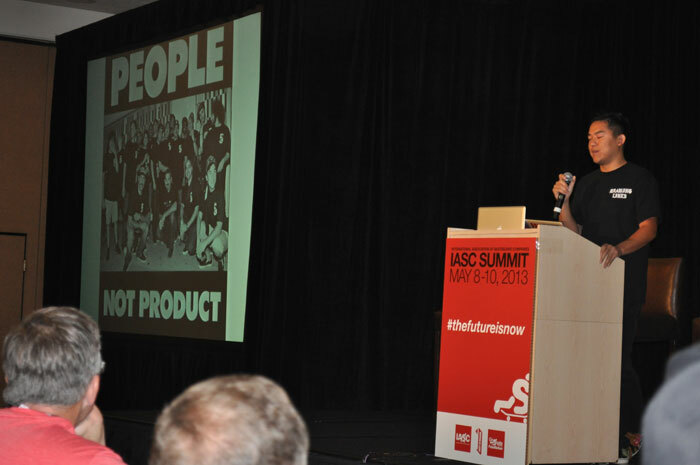 Individuals are also encouraged to join to express their support for skateboarding. 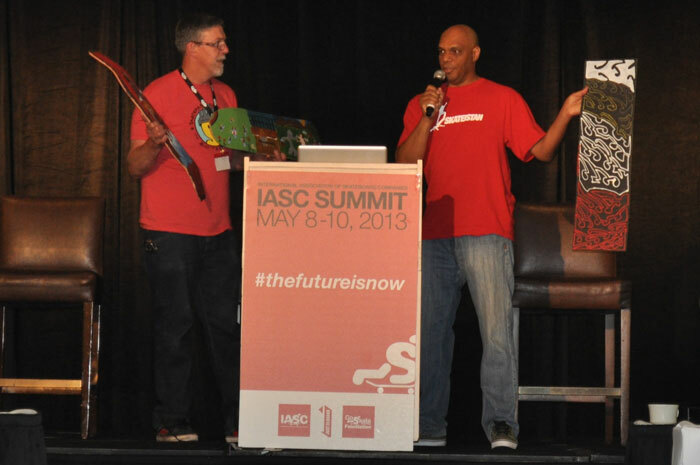 IASC Executive Director Josh Friedburg on the left and Chairman of the Board Don Brown on the right. Members of the IASC Board of Directors. 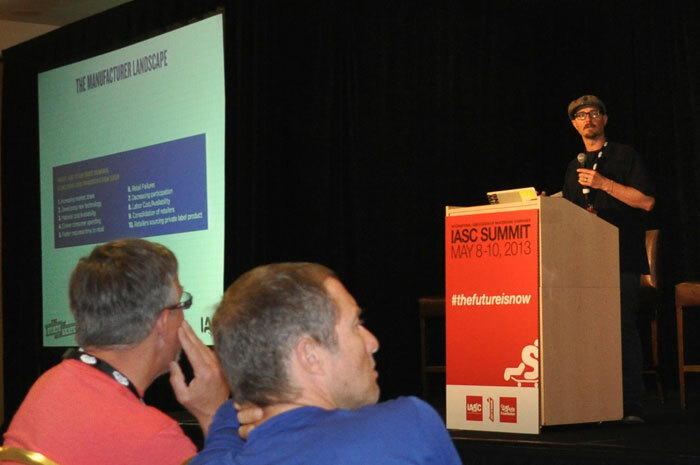 Don Brown, Chairman of the Board at IASC & Senior VP Marketing at Sole Technology. 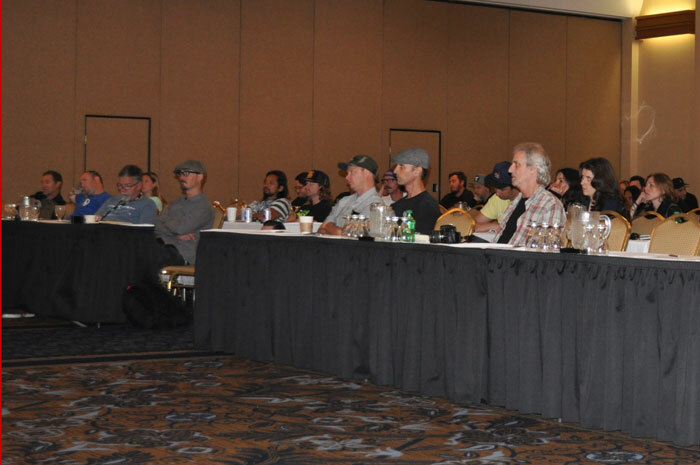 Mike Lewis, Editor-in-Chief of TransWorld Business, giving a presentation on the State of Skate - an in-depth, data-driven look at the state of the industry. 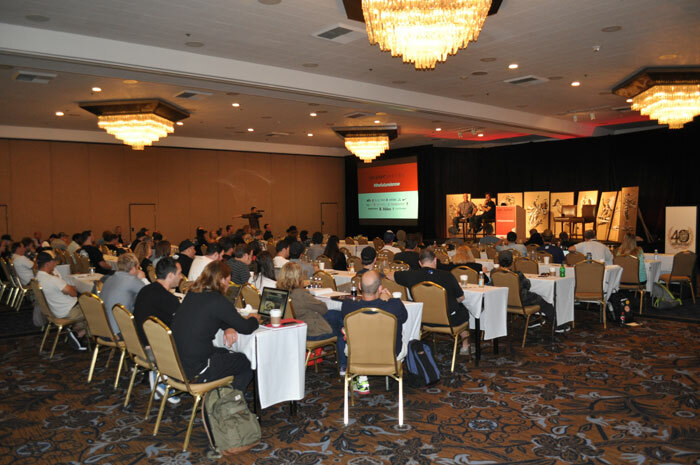 "Brands vs. retailers - the battle continues..."
Bobby Kim, Co-Founder of The Hundreds: Skateboarding is up for grabs, so stop talking and start taking. 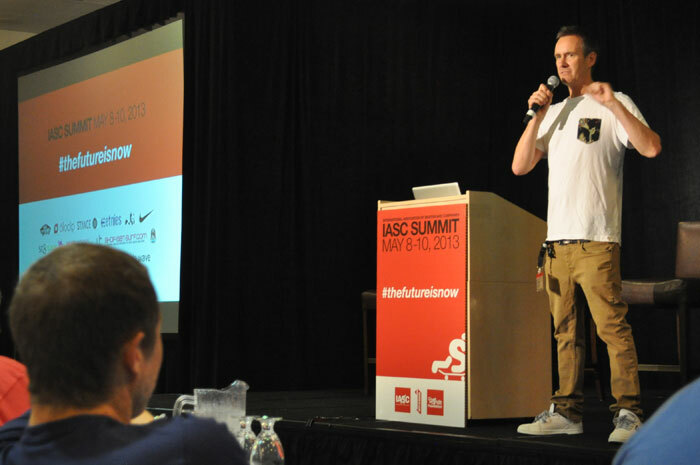 "Hi, my name is Bobby Hundreds...and I'm a skateboarder." 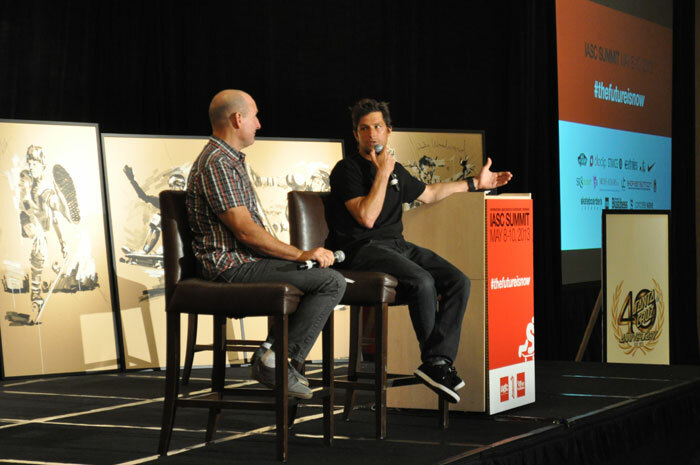 "I always say that everything cool begins with skateboarding." 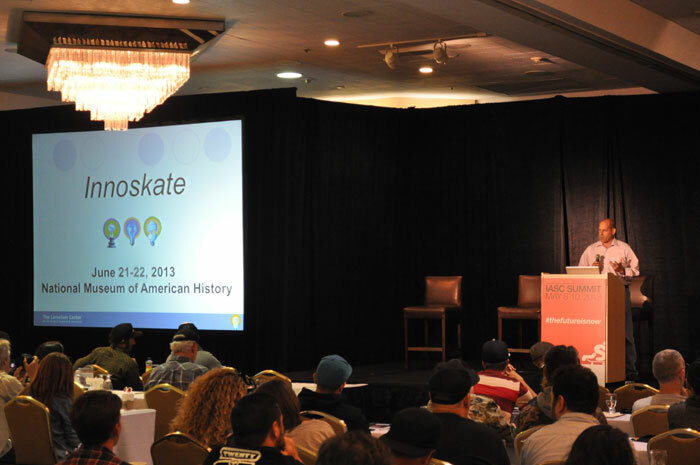 Jeff Brodie, Deputy Director of the Smithsonian Institution, detailing the upcoming #innoskate2013 event in Washington D.C.
Paul Schmitt with Bryan Ridgeway of Skateistan. 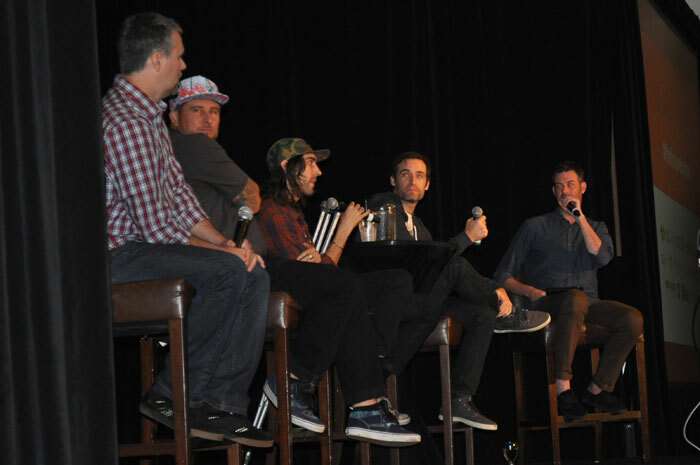 Josh Friedburg, CEO of Know Products; Jamey Stone, Publisher of Skateboarder Magazine; Kevin Duffel, Editor of TransWorld SKATEboarding; and Jessie Fritsch, Content Producer at Ride Channel discussing skateboarding’s current digital media landscape. 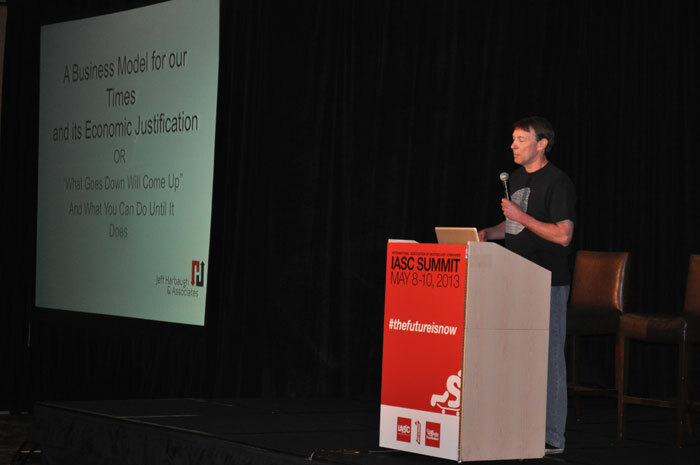 Jeff Harbaugh of Jeff Harbaugh & Associates presents a Business Model for our Times and its Economic Justification. 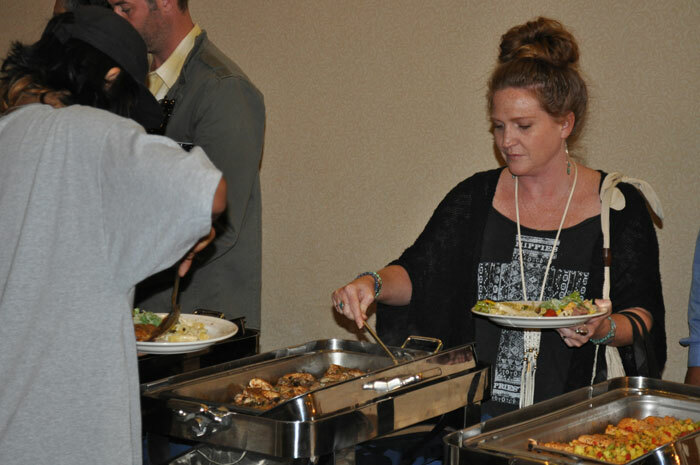 Lunch provided by Aflac Accident Insurance. 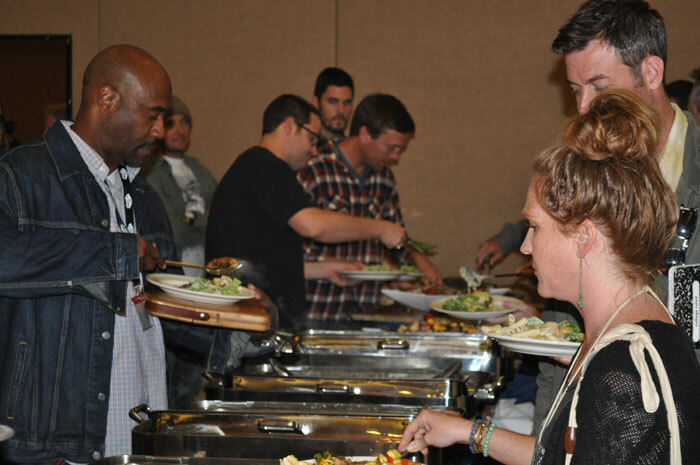 Lunch was a great time for the industry's most influential players to catch up and network. Todd Richards, Olympian and lifelong skateboarder takes a look at the impact of the Olympics on the snowboarding industry and what skateboarding can expect as it edges ever closer to Olympic inclusion. Brian Schaefer from Skatepark of Tampa. Malakye.com's Chad Mihalick on the left and Mike West of 686 Technical Apparel, Matix Clothing and New Balance Numeric. 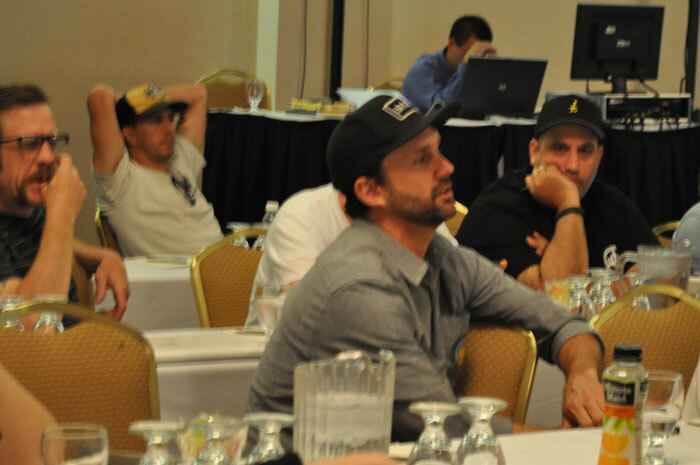 Per Welinder (on the left with striped shirt) and Steve Van Doren of Van's (closest right) listen to the discussion on skateboarding's inclusion in the Olympics. 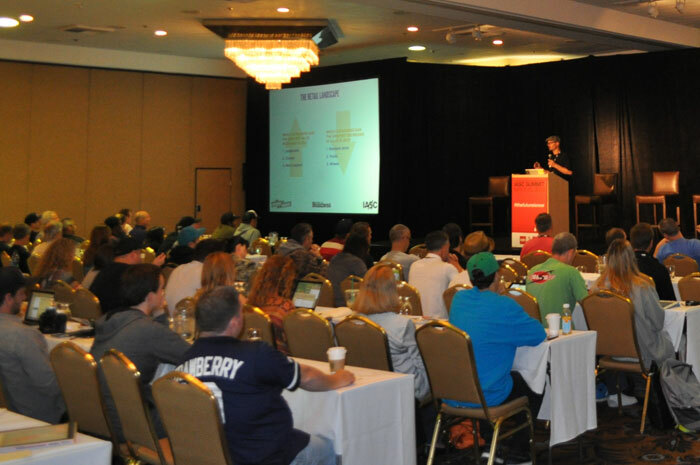 A packed room for the Olympics discussion. 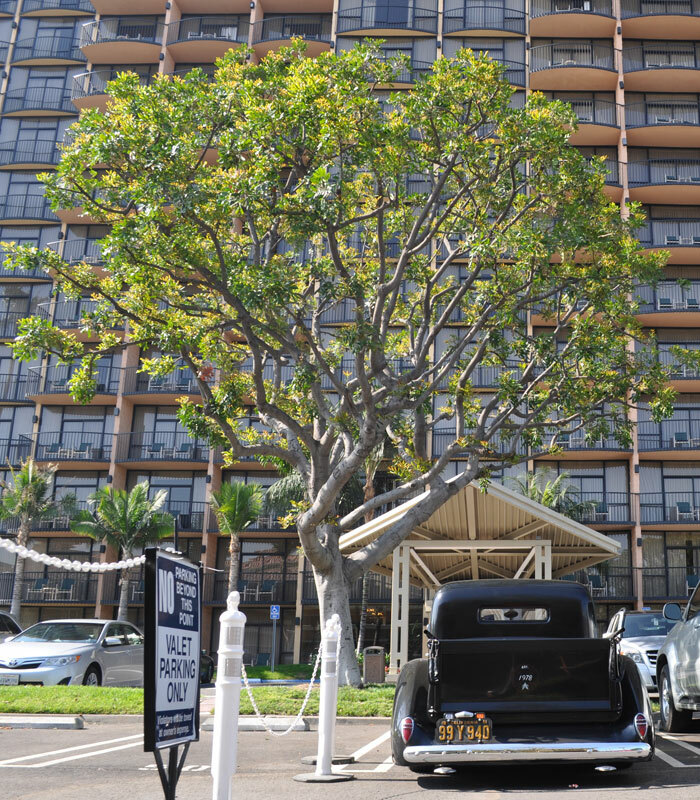 The Sheraton Park hotel in Anaheim, Calif. 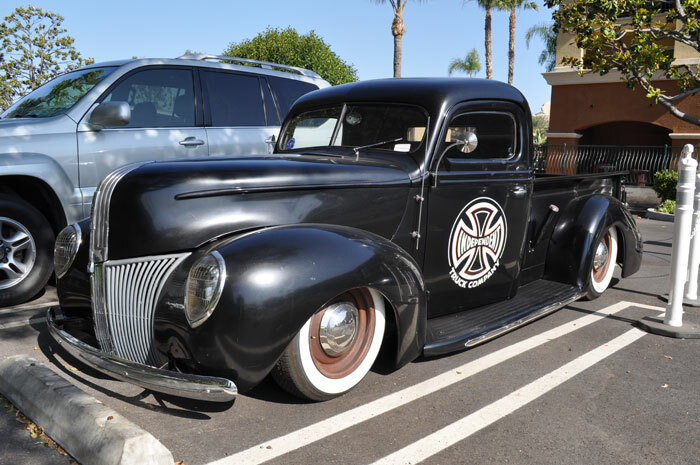 Independent Truck Co., part of the NHS family. 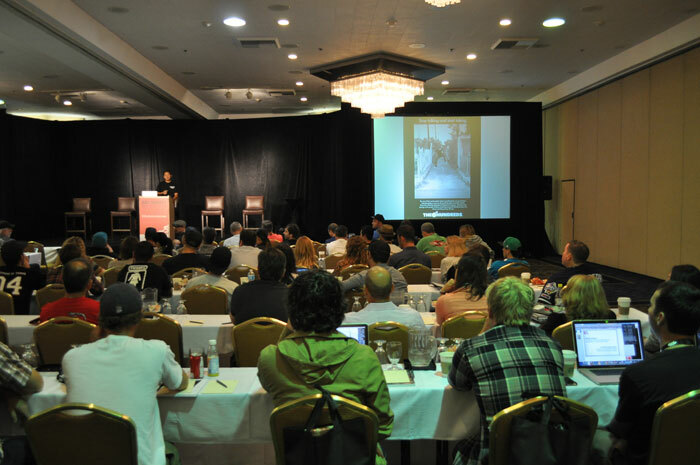 Kicking off Day 2 at the IASC Skateboarding Summit. 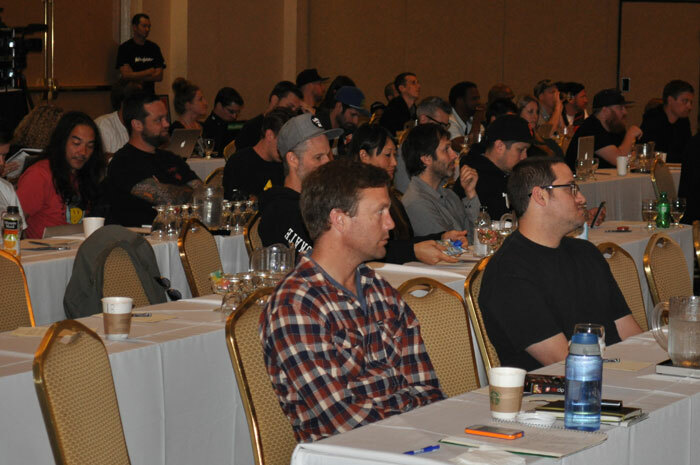 Robert Brink, Digital Communications Manager Emerica/Altamont; Heath Brinkley, Founder of Social Ops; and Joel Jutagir, Owner of Metro Skateshop discuss digital strategy and tools from a brand, skateshop and rider perspective. 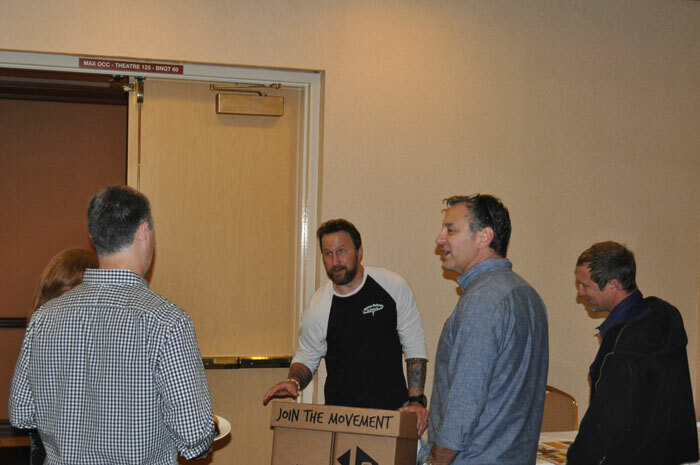 Bruce Boul and Steve Simon of Art of Board - I Ride I Recycle. 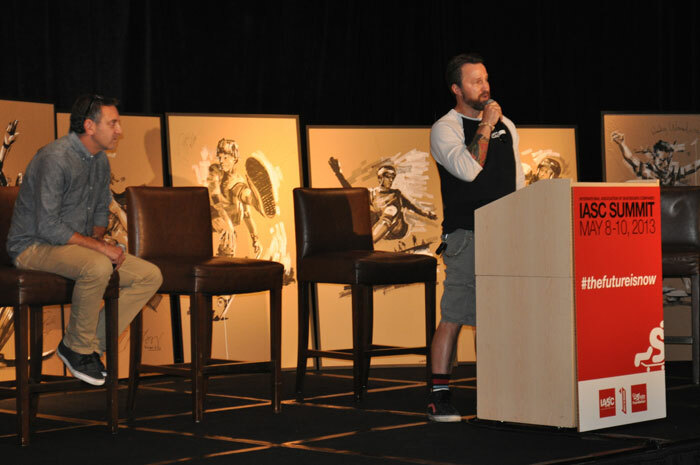 Oscar Loreto of Adaptive Action Sports. Vina Tinoco of Next Up. Time to catch up and connect. 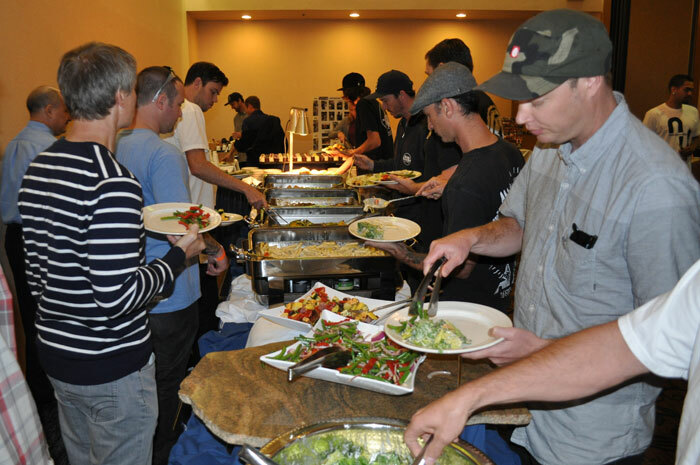 Aaron Levant of Agenda, Chad Mihalick of Malakye.com, and Mike Lewis of Transworld Business dig in. Bruce Boul showing off the new I Ride I Recycle bins. 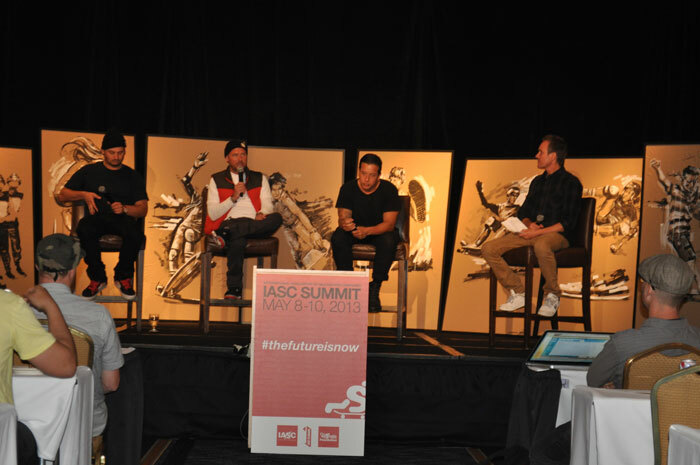 Nick Tershay, Founder of Diamond Supply Co.; Johnny Schillereff, Founder/CEO of Element; and Angel Cabada, Founder of Supra Footwear, discuss the roadmap for growing skate hardgoods companies into lifestyle brands. 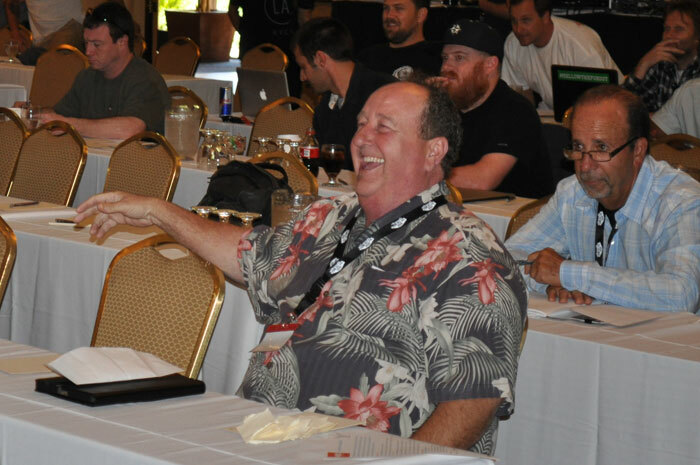 Steve Van Doren, the son of Vans co-founder Paul Van Doren. 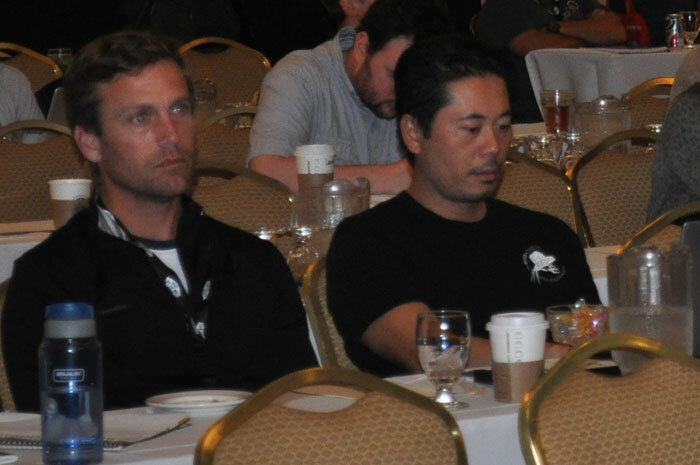 Malakye.com's Chad Mihalick and Aaron Levant of Agenda listen to the lifestyle discussion. Don Brown getting the crowd loosened up. 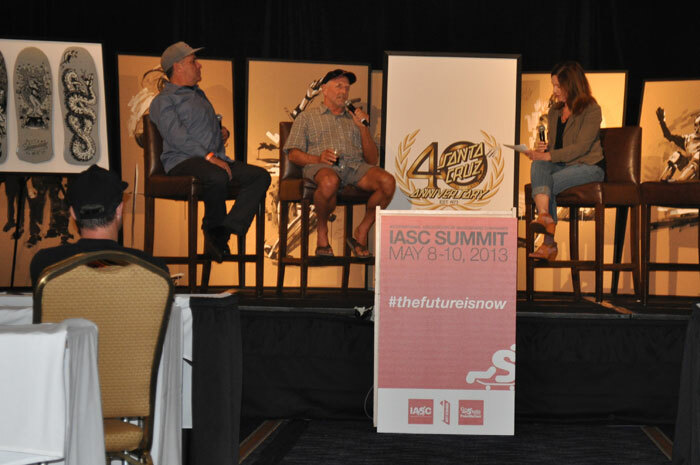 The closing keynote with NHS Founder Richard Novak and current NHS CEO/President Bob Denike talk 40 years of Santa Cruz Skateboards with Tiffany Montgomery of Shop-Eat-Surf. 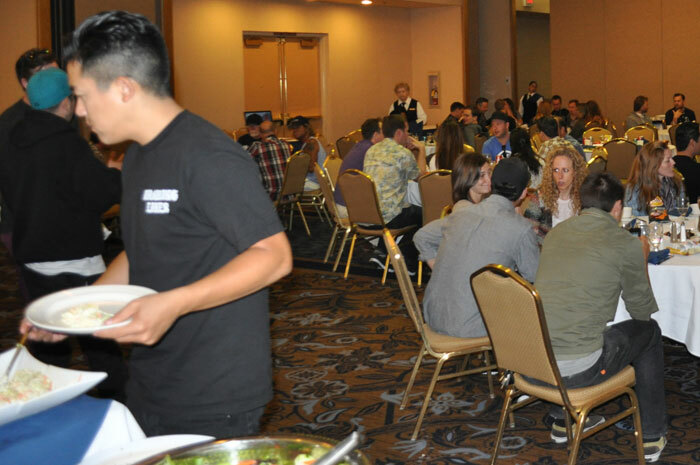 The NHS crew was proud to accept an Icon Award at the 4th Annual Skateboarding Hall of Fame Induction ceremony held in the same room the night before. 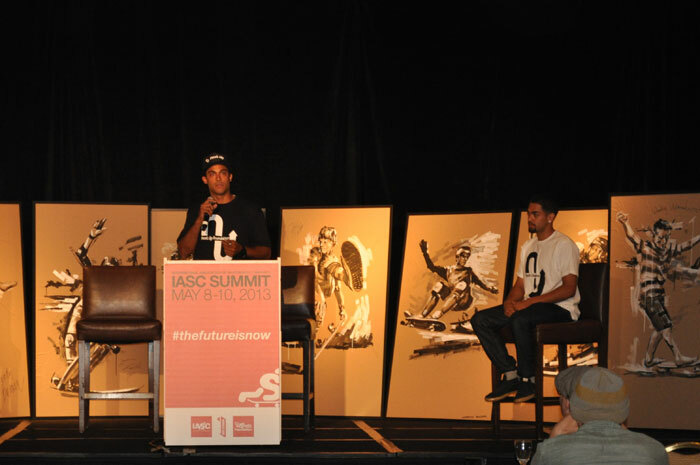 "There are a lot people outside of skateboarding that want to get involved with skateboarding and we need a united voice to be able to communicate with them - IASC is the conduit to connect with those outside associations."